In fact, it is said Cord has an effective intelligence, propaganda machinery and a mobilisation unit operating independently that has been able to work on strategies to remove Jubilee from power using the constitutional laid down structures. They are these networks that are said to have advised key players in Cord to go slow and introduce the referendum aspect instead of mass actions as many had anticipated at Saba Saba Rally on July 7. Raila and his allies – Kalonzo and Moses Wetang’ula among others are said to have been duly briefed that a special unit had been put in place by the establishment to effectively manage mass actions and the perceived one million march trek to State House in a people’s power revolution. To start with, anti-riot vehicles with coloured chemicals were to be used to spray the legion of participants. The coloured chemicals would have been used to identify those involved in the crimes making it easier to be spotted by police and arrested. It is said the coloured chemicals take about a week to fade off from the clothes or any part of the body and even if one took off from the city, he would have been spotted anywhere in the country and nabbed. This government’s tactic coupled with the alleged treason letter is said to have sent Raila and his allies into panic hence, the change of style and their envisaged mass action strategy to pressure Jubilee’s government abandoned. Unconfirmed reports reveal that whereas Cord was celebrating having been able to supposedly intercept the controversial secret letter addressed to Solicitor General Njee Muturi from Joseph Kinyua, the Chief of Staff and Head of Civil Service, they argued that it was leaked out by state security agents to scare the opposition and have the rally not achieve its goals cannot be ruled out. Another scare the government used was to deploy thousands of security men on Nairobi streets its suburbs and perceived Cord stronghold areas of Kibera, Huruma, Mathare to keep would-be Saba Saba Uhuru Rally supporters indoors. It is on these grounds that Kalonzo, while addressing the rally, claimed Cord supporters had been blocked from accessing the venue. For one year, the opposition is said to have gathered information that the Jubilee side was losing ground fast and a need to capitalise on it was necessary and a welcome move. The idea seems to have worked out well, going by the re-loaded opposition that has effectively woken the president and his deputy from slumber after one year of political honey moon to start criss- crossing the country in the name of initiating developments. Both sides are watching each other like hawks, but the most observant diplomats in the capital, intelligence analysts and investigative journalists have noticed a big problem. Already word has it that Prof Kivutha Kibwana is the brains behind the referendum being pushed by Cord. A list of those to be in charge of the referendum nitty gritty is being composed. However, one thing is clear; an Asian is being fronted to chair the committee and the name of Prof Yash Pal Ghai features prominently. To sit on the committee are John Githongo, Davinder Lamba, Nairobi lawyer Sifuna, Prof Makau Mutua to represent those in Diaspora, lawyer Maina Kiai, senator Agnes Zani just to mention but a few. The name of prominent Nairobi lawyer, Pherozee Nowrojee is also mentioned as that of Ken Wafula, a former NGO council chairman. The Jubilee government and the opposition are not evenly matched. This might seem like an obvious and elementary point, until the fact that Cord is actually not prepared, as a political formation, for the kind of antics its chief principal, Raila, has up his sleeves. An incumbent government and its opposition are never evenly matched, but many an opposition has ousted many an incumbent regime. In the case of Cord, Raila’s latest tactics, particularly the ones he imported alone from the African Presidential Centre of Boston University, USA, are working big time as the Jubilee side tries to counter with a scheme of dividing the opposition. They have reached a section in Cord to oppose a number of its strategies. Keen observers could tell that Raila was in the biggest trouble of his life since his detention years when he suddenly switched tactics from the Saba Saba agenda to a national referendum gamble on July 7 2014. He met a rebellion from his own chieftains with majority skipping the rally and opposing the referendum. Having promised the Cord faithful, and all other Kenyans that he could whip up a political storm in Kenya, on or soon after July 7, only to come up with a referendum push was a huge let-down for his followers, political analysts are still reading the script. However, his allies say it was a tactical retreat to gauge and subdue the high political temperatures that had risen sending negative signals, including bloodshed. Analysts say that ever since Raila came up with referendum talks, the political heat has slowed down. Raila now finds himself caught in the same trap he was in before his three-month break at Boston. Once again, his leadership of both ODM and Cord is being questioned from within by younger generations. The greatest shock for Raila came on Thursday July 17 2014, when the Cord constituent parties separately held their parliamentary group meetings. The meetings caught media houses by surprise, and with good reason. According to insiders present at the PGs, Raila, a born schemer and plotter by far much more than his co-principals in Cord, Kalonzo Musyoka, the Wiper leader, and Moses Wetang’ula, the Ford-Kenya leader, faced a barrage of questions from his troops. The ODM PG was a stormy meeting with MPs complaining most loudly about not being consulted on a wide range of issues and decisions of national importance and significance. MPs dissatisfied with the way Cord is performing its work as the opposition shared their frustration at being sidelined in the build-up of pressure for a national referendum. Sources said the majority of the 72 ODM MPs who attended the PG meeting chaired by Raila at Orange house told the party leader to his face that the referendum push would flop if the process was not “consultative and all-inclusive”. Raila, having called the meeting to criticise defiant legislators was upset to find himself on the receiving end instead. Meanwhile, Kalonzo and Wetang’ula were also busy leading separate PG meetings for their respective Wiper and Ford Kenya parties at Maanzoni and Elementaita lodges respectively. The three Cord parties are set to hold a joint PG, to agree on the structures of the proposed national referendum team. 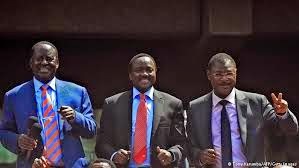 As schemers themselves, and having served in government, with Kalonzo having been continuously in the cabinet since 1987 until 2013, the three principals were keenly aware that Uhuru must have both spies and enemies amongst their legislators. This is one reason the elected leaders have been left out of the major strategising and decision-making of the principals’ post-Boston. Suspicion being the key underlying factor as the opposition keeps on scheming and counter scheming on how to checkmate Uhuru. By last week, Cord schemers were reported to have filed a document to the effect that the Saba Saba calls had united stronghold Jubilee zones under one roof including the rebellious Kalenjin vote bloc. The documents reveal that before the calls, rebellion likely to split the ruling alliance was greatly felt but has since fizzled out since the arrival of Raila. A new game plan has to be worked out on to make fresh inroads in the area or completely forget the regions and consolidate their power base where Raila won in 2013, it was agreed. Another strategy by Cord is to have Raila unite his outfit after the controversial loss and groom one of his allies to take charge ahead of 2017. 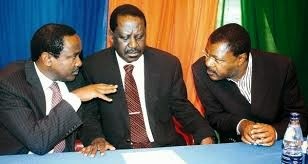 In fact, word has it that Raila is working on a power sharing formula between Kalonzo and Wetang’ula to avoid a possible break-up. He is well aware of outcries in Luhyaland and Kambaland on grounds that prominent sons and daughters from the communities in government and influential positions are being targeted. During the Saba Saba rally, a list of Kambas who had been sacked in the military was read out. The things which Raila was taught at Boston were many. The principals’ biggest catch in the post-Boston phase has been Governor Kibwana, a law professor and constitutional expert. Another is Kakamega senator Bonnny Khalwale. Kibwana’s last posting in the Grand Coalition regime of Kibaki and Raila was as one of a handful of presidential special advisers based at the Office of the President at Harambee House, Nairobi, and supervised by Prof Nick Wanjohi. Among his colleagues were former Rarieda MP and cabinet minister Raphael Tuju. Kibwana’s briefs for Kibaki, which we have seen, were devastating when it came to the other side of the Grand Coalition; in fact, some of his newfound friends would not go anywhere near him if they ever see the folders he maintained on them while at OP. But now, Kibwana has been one of the chief engineers of the Saba Saba and national referendum changing, but not evolving, tactics and strategies. The principals have also joined hands with such NGO “gurus”. The result has been the launch on July 7, of the Okoa Kenya Movement. Raila and Kalonzo are technically jobless, being merely leaders of their political constituencies. Their biggest power is the threat to fell elected leaders. In fact, Kalonzo recently made an open threat against Wiper rebels, claiming they had been elected in his name. Raila has such a hold over Luo Nyanza that his word is law in the region. Jubilee insiders say the Cord principals have suddenly realised that two of them mere figureheads who have no budget to administer hence their current schemes that have sent Uhuru and his deputy panicking. Governors in all parties and coalitions are heads of their own mini-governments. The reforms and devolution Raila, Kibwana, Githongo, Kiai and others have spent years on, and donor millions of dollars, are finally here and the biggest beneficiaries, Uhuru and Ruto, were perceived for 20 years as being conservative diehards. A key member of the Cord strategy team is New York constitutional lawyer, scholar and teacher Makau, alongside Kibwana. Makau, the Dean of the University at Buffalo Law School, where he is also a Suny Distinguished Professor and the Floyd H & Hilda L Hurst Faculty Scholar, used to be a poisonous enemy of Raila. Long before 2017, Prof Kibwana and Prof Makau might well join hands, now that they are back on the same side, politically speaking. Meanwhile, back to the present: It is now clearly emerging that the three Cord principals have been behaving in such a manner as to capture all the media headlines and both national and international attention and divert it from Uhuru and Ruto but also from governors, senators, MPs, MCAs and other operatives of the devolved government stratum, something that seems to be working well. Two unelected, Raila and Kalonzo, and one elected Wetang’ula have grabbed all the limelight event from the presidency which has its own media units and other ways of influencing coverage and public opinion and even from the county governments, cabinet secretaries and principals. It has forced the government to go back to the drawing board and host journalists in five-star hotels to give opposition unfavourable coverage and blackout. Governors, senators, MPs, MCAs and other operatives of the devolved governments have thus been thrown deep into the shadow of the three Cord principals. Whoever advised Raila to declare at a Muslim event, the iftar dinner he attended as Mombasa governor Ali Joho’s guest, that the Lamu massacres would end only after land grabbed in the 1960s and 70s was returned betrayed the game plan. We have information that T-shirts, caps, banners with words: I support the Referendum to Okoa Kenya are to flood the country. To endear to western capitals, a move by Jubilee to enter into a working relationship with the Chinese communist party is the selling point. The head of the Chinese ruling party was recently a guest of Uhuru at State House where a working relationship was struck.